Old marine hospital soon to be a new museum campus. Longtime Tisbury building inspector Ken Barwick cannot perform inspections because he happens to live nearby. 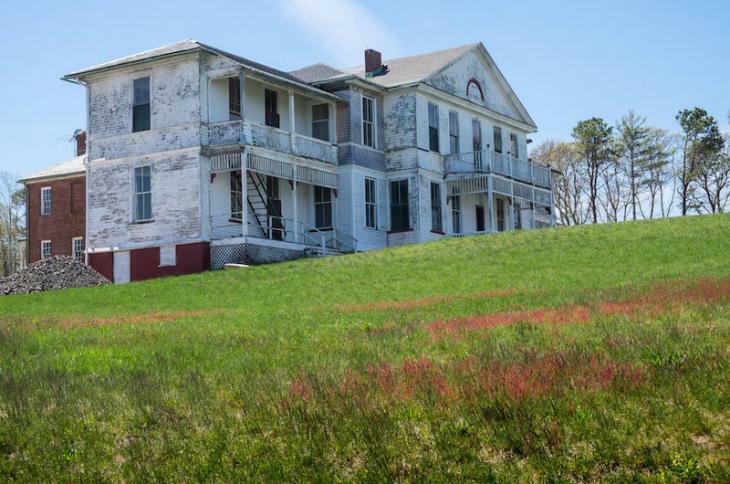 Tisbury town leaders are in a difficult spot after their building inspector, on the advice of the state ethics commission, recused himself from the major renovation project that will convert the old marine hospital into a new campus for the Martha’s Vineyard Museum. Longtime building inspector Kenneth Barwick said he was contacted by the ethics commission in late May and told that he cannot participate on the project because he lives less than 300 feet away from the site. At around the same time, the $24 million museum project broke ground. It is the largest building project the town has seen in decades, is expected to take two years to complete and will require numerous inspections and signoffs by the building inspector. There is no assistant building inspector in Tisbury and attempts by the selectmen to employ the services of an inspector from another town so far have been unsuccessful — partly because the scope of the work needed is so large and expected to go on for years. Mr. Barwick said late last week that he has never been in a situation like this. Town administrator John (Jay) Grande said the matter is expected to be discussed at the next selectmen’s meeting. Mr. Barwick first informed the selectmen of the problem at a meeting on May 23, minutes show. He said the state ethics commission and the town attorney had both advised him to recuse himself because the value of his property could be affected. “I’m told I cannot speak with these people, I cannot issue these people any permits, I cannot perform any inspections, I can’t touch the job, if you will,” he told the selectmen. Mr. Barwick’s only action on the project to date was to refer it to the Martha’s Vineyard Commission for review last year. He told the selectmen that there was only one other inspector on Island with the experience, knowledge and certification to review the plans: Leonard Jason Jr., who currently works as building inspector in Edgartown, Chilmark and Aquinnah. On June 13, Mr. Barwick returned to the selectmen to inform them that Mr. Jason had agreed to act as building inspector during demolition, minutes show. But once that work was completed, Mr. Grande said Mr. Jason informed the town that he could not continue due to his responsibilities in the other towns. “Kenny asked me and Melinda [selectmen Melinda Loberg] asked me, I just don’t have the time,” Mr. Jason told the Gazette by phone last week. Mr. Jason, who has been a building inspector on Island for 33 years, said he had never heard of a situation like this. The Tisbury selectmen appealed to West Tisbury, but selectmen in that town said they could not loan their building inspector. Meanwhile, the museum filed a building permit application last week. In the next 30 days, the town will need to contract with a certified plan examiner to review the plans and issue a permit, Mr. Grande said. But with construction booming on the Island, it’s been difficult for the town to find anyone with the required certification who has the time to do the work. “People are in high demand,” Mr. Grande said. He said he has reached out to current building inspectors on Island, a couple of retired building inspectors on the Island, building inspectors in Falmouth — and finally, has turned to the state. Late last week he said the state had notified him they were working on it but still had not appointed or approved anyone to work on the project. Mr. Jason said the museum project will likely require more than multiple inspections during the construction phases and could also face zoning issues. Even beyond that, once the project is complete, when the museum holds events at the property, permits will be required. “We need a longer term solution for shared services,” Mr. Grande said. remembering the St.Pierre Summer Camp....Certainly should be part of the buildings history...My grandson, enjoyed a few summers at the wonderful camp.......Thank You to the St.Pierre Family for the memories. Per diem a retired Health Agent perhaps? Each of the island towns are experiencing high demand for inspections and permitting. Perhaps hiring an inspector that is shared by the towns could solve this and ongoing issues with inspectors needing time off, etc. How work load is divided and the inspectors duties would be split would need to be thought out. Dare I suggest a Regional Island Building Inspector..??? A noble idea but will probably never happen b/c who would that Dept report & manage to?? A solution long overdue just for sheer efficiency.. Would the Dukes County Commissioners pursue this?? Perhaps a too political hoy potato..
As a licensed Building Official, I find this so-called ethics claim bogus, and at least insulting to the Town Building Official. Building Officials across the country routinely deal with neighbors, relatives, former business associates (good and bad)and are perfectly capable of separating their own interests from their professional duties. I have never met Mr. Barwick but I am sure he would not have this position if his ethics were questionable. Industry wide, the only prohibition for Building Officials is that they do not inspect their own work, and they do not do construction work in their own jurisdiction as a side business, unless it is their personal residence. The Building Official merely helps to coordinate the contractor and designer's compliance with written code. There is little room for any Building Official to deviate, and doing so would cost him his reputation and job. A project of this value will have designers and contractors perfectly capable of keeping the job in compliance with code, and Mr. Barwick should be allowed to do his job. I heartily agree. Having sat on ethics' boards in NM, I applaud (and agree with! )the appropriate faith Doug Coulter shows in town officials charged with this role. I'm un clear why certain entities apparently question the ethics of a long standing town official. Has town considered (or contacted the Ethics Board about) hiring a Registered Architect as the town's representative on this project. The trustees of the museum might vote to fund a special inspector for the duration of the project. Have the legislature change the law to add: "Said 300 ft distance can be waved upon the approval of local Municipal authorities if a committee of 3 or 5 neutrals is formed to review all decisions and actions, by the inspection, on a monthly basis." Is there a person across the sound in Falmouth, Woodshole etc. ?